Successfully Added HD IP Camera & Baby Monitor - FHD Resolutions, Motion Detection, Pan & Tilt, Two Way Audio, App Support, Push Alerts to your Shopping Cart. 1/3 Inch CMOS sensor brings Full HD video and image quality for this baby monitor and IP camera. Two way audio with build in mic and speaker to communicate remotely via the smartphone app. Plug and Play with ONVIF support ensures a quick easy setup. Pan and tilt make it easy for this camera to cover an entire room. With HD resolutions, App support as well as pan and tilt functionality this state of the art IP camera has multiple uses. It can operate as a nanny cam or even a baby monitor keeping a watchful eye over your young. 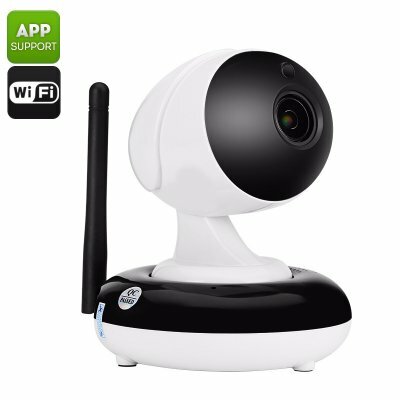 Alternatively, this IP camera can operate as a security camera and keep guard over your home or office while you're out, you can even use it for chatting online via Skype, Hangouts and other messaging apps. The Wi-Fi support makes connecting this IP camera to your home network quick and easy, once plugged in you can use the phone app to check in whenever you desire. With a built-in microphone and speaker, the camera benefits from two-way audio and video can be steamed or recorded from anywhere with an internet connection. IR LEDs provide up to 10 meters of night vision so this IP camera to work day and night down to 0.3 Lux. Being able to rotate through 270 degrees and tilt up to 90 degrees this wide-angle camera can cover an entire room. Multiple online visitors can view the video stream simultaneously and with motion detection, the camera can alert you via email if it detects movement. It will even take a snapshot and send it online or to a micro SD card so you have a digital attendance recording all those who come and go from your premises. This full HD IP Camera comes with 12 months warranty, brought to you by the leader in electronic devices as well as wholesale cameras and baby monitors..